[140 Pages report] The size of the global carbon capture & sequestration market is estimated to be USD 4.25 Billion in 2016, and is projected to grow at a CAGR of 13.6% from 2016 to 2021, to reach USD 8.05 Billion by 2021. Market growth is driven by factors such as the growing demand for power & CO2-EOR techniques and rising environmental concerns worldwide. The overall market size has been finalized by triangulating the supply-side data, which include product development, supply chain, and annual generator sales across the globe. 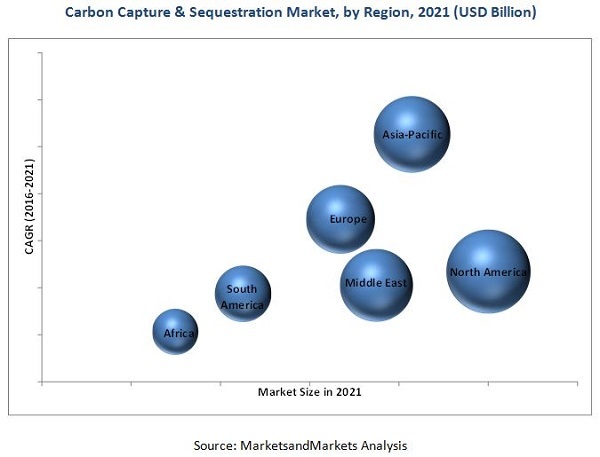 The global carbon capture & sequestration market is projected to reach USD 8.05 billion by 2021, at a CAGR of 13.6% from 2016 to 2021. This growth can be attributed to rising environmental concerns across the world and increasing demand for CO2-EOR techniques. The report segments the carbon capture & sequestration market based on services into capture, transport, and sequestration. The capture segment recorded the largest market size in 2015. This segment has further been segmented into pre-combustion, post-combustion, and oxy-fuel. Pre-combustion segment held the largest market size in 2015, given an increase in the number of pre-combustion projects. The carbon capture & sequestration market has also been classified based on application into EOR process, industrial, agricultural, and others. The demand for EOR process is expected to increase during the forecast period, due to its usage in a wide range of applications in the oil & gas industry. North America held the largest market share, followed by Asia-Pacific and the Middle East. In 2015, the U.S. dominated the North American carbon capture & sequestration market. This can be attributed to government support, followed by presence of more coal- and gas-fired power plants. Meanwhile, the market is estimated to grow the fastest in Asia-Pacific, owing to more number of coal-fired power plants. The figure given below indicates the market size of various regions by 2021, with their respective CAGRs. The successful deployment of carbon capture and sequestration technologies is dependent on comprehensive policy support; carbon capture and sequestration lacks policy incentives. Moreover, it is costly to install and its operating cost is high. These factors are restraining the growth of the carbon capture & sequestration market. Some of the leading players in the carbon capture & sequestration market include Fluor Corporation (U.S.), Linde AG (Germany), Shell CANSOLV (USA), Siemens (Germany), and Mitsubishi Heavy Industries (Japan), among others. Contracts & agreements was the most commonly adopted strategy by the top players in the market, followed by expansions and other developments. 10.6 Mitsubishi Heavy Industries, Ltd.